Like most cities, Miami’s most pressing problems are complex. Finding equitable and sustainable solutions requires residents to become invested and engaged in the future of their community. Yet increasing civic participation in local issues ranging from resilience and economic growth to education, public spaces and transportation is a challenge. In Miami-Dade County alone, local elections generally draw less than 15% of residents and sometimes fewer than 10%. Voting, however, is only the culmination of many smaller moments of genuine community engagement and expression of community identity. The Urban Impact Lab team has learned that the most effective way to build a deeper sense of place and truly expand civic engagement is to involve residents in creative, participatory projects that serve as opportunities for expression and involvement where local challenges and solutions can be explored in new ways. Urban Impact Lab launched illuMia in 2017 as an elegant, unique way to engage residents in local issues by using the creative process and interactive art as the starting point. illuMia draws inspiration from different aspects of various global, place-based events. The team has studied how residents of New Orleans organize themselves into Krewes as part of their Mardi Gras tradition, how Sydney launched a weeks-long city-wide light art and ideas festival, and how Nuit Blanche delights visitors and resident in cities worldwide. The team merged lessons from these national and international successes with Urban Impact Lab’s own human-centered design process to create an approach that is at once inclusive and representative of Miami’s core communities while remaining engaging and interactive for any participant. Central to illuMia is the process of directly engaging and creating with local community residents and exploring partnerships with local and national organizations seeking to improve Miami’s livability, quality of life, and resilience. illuMia is one of Urban Impact Lab’s signature projects. The team developed the concept and strategy, attracted funding, and launched the project in 2017. All aspects of illuMia, including ideation, project management, strategic partnerships, curriculum development, art creation and event production are managed through Urban Impact Lab. Liberty Fields - a whimsical illumination event highlighting a public space in Liberty City using LED lights and solar powered audio-visual equipment. Explore - an ongoing educational program combining art-based STEM learning and urban exploration. Community Identity - a creative placemaking program completed in five of Miami’s core communities where local artists worked with diverse community members to create unique artwork based on their experiences and identity in this multicultural city. 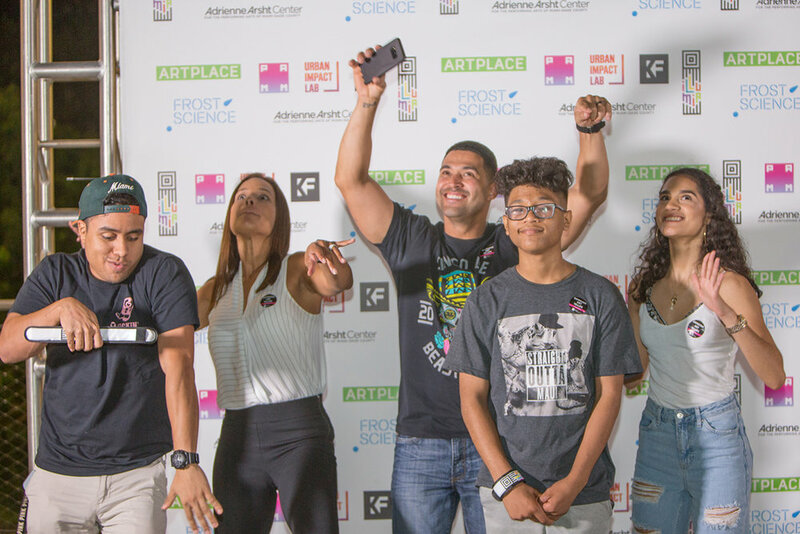 The program culminated in a large-scale, interactive projection mapping installation at Miami’s iconic Frost Science Museum during ArtWeek 2017. In its inaugural year, the illuMia project worked in 5 of Miami’s core communities: Little Havana, Overtown, Liberty City, Little Haiti and Wynwood. The team developed various strategies to engage over 300 community members, over 20 strategic partners, and 8 local artists in 15 creative placemaking workshops. In 2017, solar energy became a key component for illuMia. By exploring the relationship between community, art, and energy, participants gained first-hand insight into the possibilities of expanding solar energy in Miami. Moving forward, illuMia will continue to incorporate solar technology while exploring other local issues with partners, sponsors, and participating residents. illuMia’s reach and engagement would not have possible without the incredible help of local organizations like ConnectFamilias, FANM, New Florida Majority, and Community Justice Project. Huge thanks to ArtPlace Americas for supporting this project. Interested in partnering, sponsoring, or bringing illuMIA to your community?